SURFING: Strong healthy shoulders are a crucial element to your long term surfing success. They are also frequently injured… so lets cut to the chase and restore your surfing shoulders for good. Your shoulders are designed to function very well but when they don’t, pain is inevitable. This means less energy (the body wants to heal) less spinal rotation (neck, spine and even hips) and less paddle power so that catching waves, duck-diving and paddling are all hampered. First, a warning. Surf training principles applied regularly can greatly enhance your surfing body and reduce niggling aches and pains and prevent injury. However… shoulders are often compromised due to excessive spinal flexion and there may be calcification in the vertebrae. Some stretches, lifts and over head movements can be dangerous. If you have spinal challenges, upper spine stiffness or neck pain, visit a spinal specialist first. Surfing is all about movement and flow. If your head is not centred over your body – flow is going to be disrupted and pain will eventually haunt you. Not good if you want a strong surfing body. Always prioritise physical alignment during surfing exercises and training. Also note that lifestyle comes into play – big time. Laptop living, mobile devices and desk jobs come with a price tag. More often than not, back pain, neck pain and you guessed it … shoulder pain. Posture is a power player. Good posture = great function. Good posture = great shoulder function and stronger, functional surfers without shoulder pain. 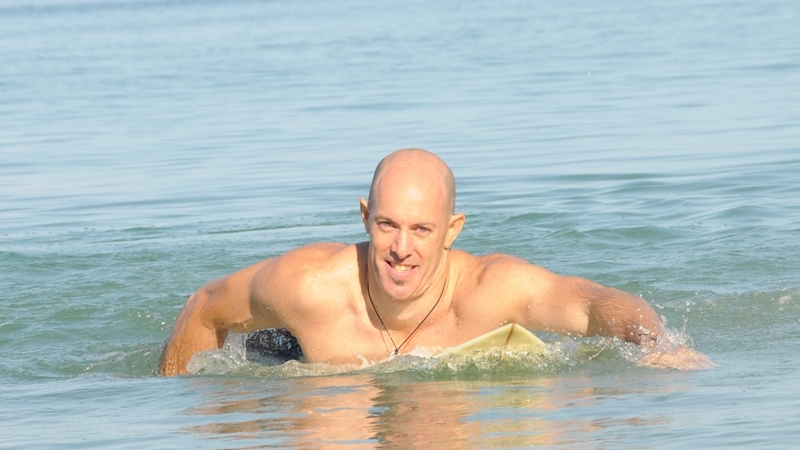 Poor posture = poor shoulder function and weaker, dysfunctional surfers with shoulder pain. As a surfer, realise that if spinal extension is not addressed, breathing mechanics, spinal rotation and forward arm motion are all negatively impacted. End result – your surfing suffers and paddling will wear down the shoulder joint and create muscular pain in the surrounding tissue. You want to be able to extend your spine so that your shoulders can move as they were designed. Start by stretching out tight muscles to help realign your body! In order for that musculature to function optimally your spine must also function optimally. For surfers that often means increasing spinal mobility. Each disc is designed to move, rotate and flex / extend to some degree – in particular the middle part of your back; known as the T-Spine or Thoracic Spine. Your goal is to improve spinal mobility so that down the spine (hips) and up the spine (shoulders) will be in the best position to heal, energise and minimise injury from paddling.